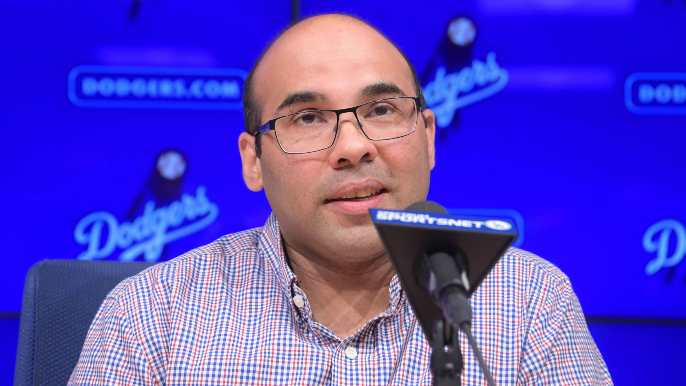 The Giants made their first splash of the offseason on Tuesday evening, acquiring former Dodgers GM Farhan Zaidi as their new president of baseball operations. The signing was met with nearly universal praise, as Zaidi is considered one of the brightest front office minds in baseball, has a background in analytics, and a track record of success in both Oakland and Los Angeles. Though the acquisition seems like a step in the right direction, Zaidi wasn’t necessarily the club’s first choice according to longtime Giants beat writer Henry Schulman. “No I don’t think so,” Schulman said when asked that very question by Brian Murphy on KNBR. “I mean they asked to talk to David Forst, and he turned them down. Then as you saw the A’s came through with extensions for everybody. I think part of that is they were due extensions, but I think part of that is also to make sure they wouldn’t jump ship. “Not to take anything away from Farhan, but I think (the Giants) were hoping to get somebody who actually had a little more experience in team building than Farhan did, but I would say he would have to have been very high at the top of the list. I was hearing his name fairly early in the process. I wasn’t sure that the Dodgers would grant permission, but the Giants had also asked about (David) Sterns from Milwaukee, so they were going after some really, really big fish. There’s no crime in not being the first choice for a job like this. Schulman also made the point that while Farhan is seen as an “analytics guy,” he fits the profile of the balanced executive that CEO Larry Baer was looking for. “This is a guy who really does believe in scouting as part of the process. He listens to scouts, and I think that’s what Larry wanted. Larry wanted somebody who lives in both worlds, and this guy has degrees from MIT and Berkeley, and clearly he has the numbers thing down, but I think he’s going to listen to his scouts. Now who those scouts are going to be? I don’t know. I would expect we’ll see some significant changes in the Giants organization in that department.